We celebrate the legacy of writer-director Curtis Hanson. It took the success of 1997's L.A. Confidential for Curtis Hanson, who sadly passed away on September 20th, to receive mainstream recognition. But as our list shows, as both a writer and director, Hanson leaves behind a legacy that reaches far beyond his James Ellroy adaptation. Hanson co-wrote this under-seen Canadian thriller with Danish novelist Anders Bodelsen. The Silent Partner introduces the first of many sociopaths to appear throughout Hanson's work in the form of Christopher Plummer's violent bank robber. He finds his latest robbery hampered by Elliott Gould's bank teller, who learns of the planned robbery beforehand and manages to pocket most of the targeted money himself. This leads to a tense game of cat and mouse as Plummer engages in increasingly psychotic attempts to retrieve the money he believes should be his. Look out for John Candy in an early role as Gould's co-worker. As a screenwriter, Hanson collaborated with the great Sam Fuller for this controversial and misunderstood thriller. When Kristy McNichol adopts a cuddly white-haired Alsatian dog, she's shocked to discover her new pet is trained to attack black people on sight, having been previously owned by a white supremacist. Rather than having the dog put to sleep, an African-American dog trainer (Paul Winfield) becomes determined to retrain the animal. Misunderstanding the film's intent, Paramount shelved its release, but it's one of the most honest and damning indictments of racism ever filmed, unfortunately just as poignant three decades later. Hanson directed this early David Koepp script, a classic noirish thriller that subverts the femme fatale trope by positing Rob Lowe as the film's seductive antagonist (a homme fatale if you will). He's an enigmatic and charismatic stranger who enters the life of James Spader's mild-mannered yuppie, initially winning him over with his risk-taking attitude to life, but quickly becoming a dangerous menace. The two brat-packers are at the peak of their careers here, and share a winning chemistry. Think of it as a more grown-up Fight Club. After making a villain of Rob Lowe, Hanson gave another former '80s teen star the role of her life in this psychological thriller. Rebecca DeMornay is chilling as the nanny who wreaks vengeance-fuelled havoc in the home of Annabella Sciorra and Matt McCoy. Hanson puts together some well-crafted suspense sequences, but it's the performance he mines from the cast-against-type DeMornay that makes this a standout from the many domestic thrillers of its era. Late in his career, Hanson finally received plaudits for his adaptation of James Ellroy's '50s set crime novel. With a slew of bad Tarantino knock-offs polluting movie theatres throughout the mid-90s, L.A. Confidential hit the reset button on crime cinema, delivering the sort of mature, intelligent drama the genre had largely forsaken, making stars of Aussie duo Russell Crowe and Guy Pearce in the process. "They don't make 'em like this anymore" was the popular refrain with regard to Hanson's film, comparing it to the classic crime films of the era the movie takes place during. 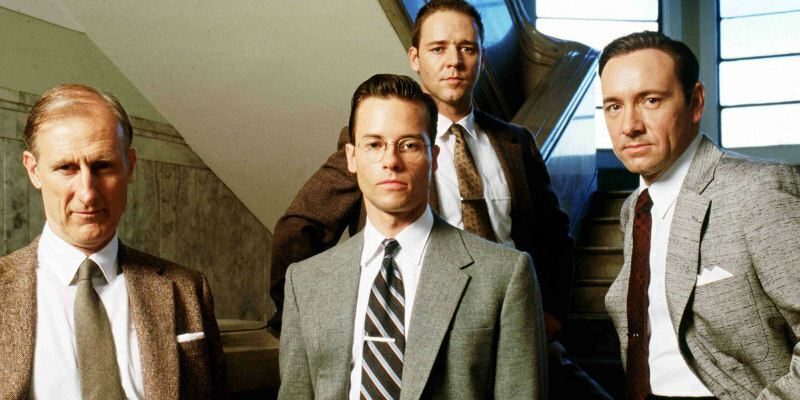 It's a shame they don't make 'em like L.A Confidential anymore.